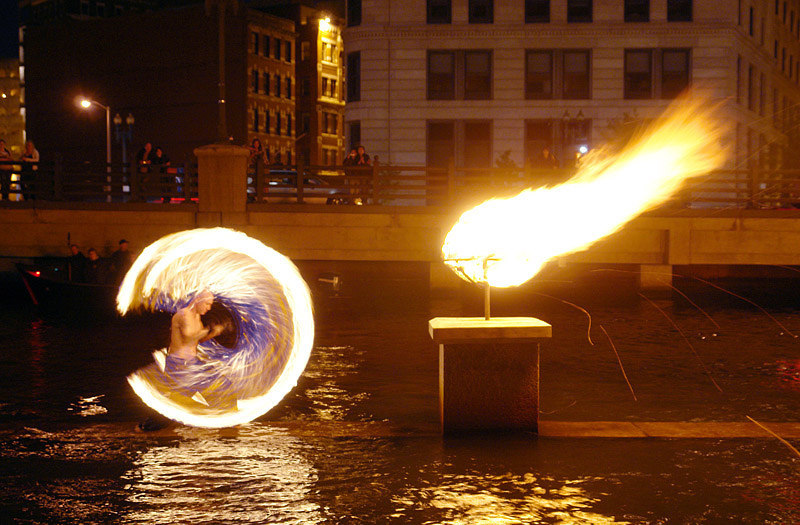 This WaterFire lighting will light up over eighty braziers from Waterplace Park to Memorial/South Main Street Park. 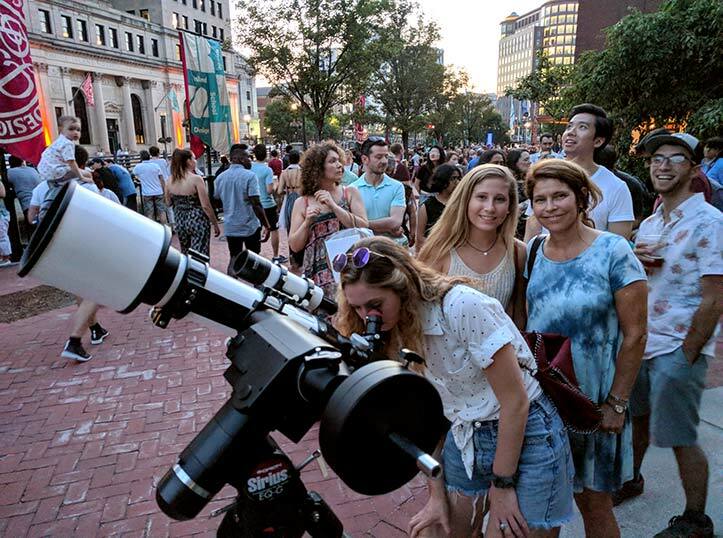 Lighting occurs shortly after sunset and the event will continue until 11:00 p.m. For this lighting, only half of the braziers in the Waterplace Park Basin (along with the rest of the installation downstream from the Bridge of Stars) will be lit during the first lighting after sunset. The remaining braziers in the Basin will be lit to coincide with the Flames of Hope Torch procession’s arrival later in the night. Lighted State House at dusk with State Ballet of Rhode Island performers on the steps. Photograph by Erin Cuddigan. The Illuminations of Life Torch Ceremony will begin on the Statehouse steps at sunset and the torches will arrive in Waterplace Park Basin approximately 60 minutes later. Half of the braziers in the Waterplace Park Basin will remain unlit until approximately an hour past sunset. At this time the Illumination of Life 150-person torch procession will arrive in the basin from Station Park leading into a Ring of Fire and the remaining fires will be lit. Once a year, tens of thousands of people gather to light the way towards hope and healing for anyone touched by breast cancer. 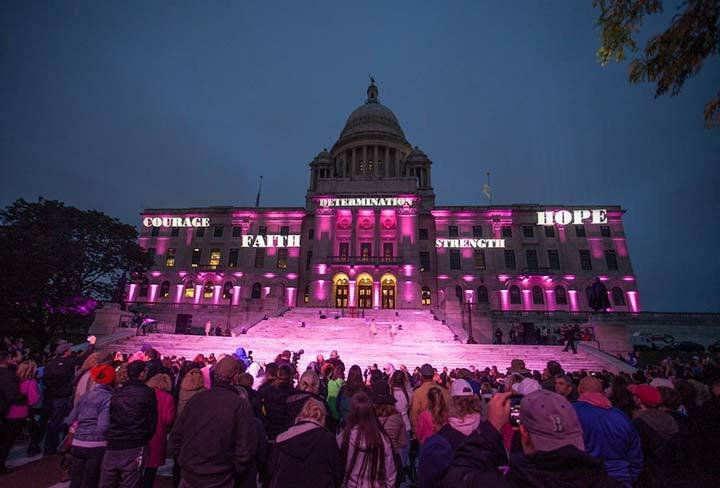 Gloria Gemma’s Flames of Hope: A Celebration of Life™ was created to honor Breast Cancer Awareness Month by turning the city of Providence PINK and sparking a movement to inspire awareness, compassion, and support. This weekend-long celebration embraces everyone who has been impacted by cancer. 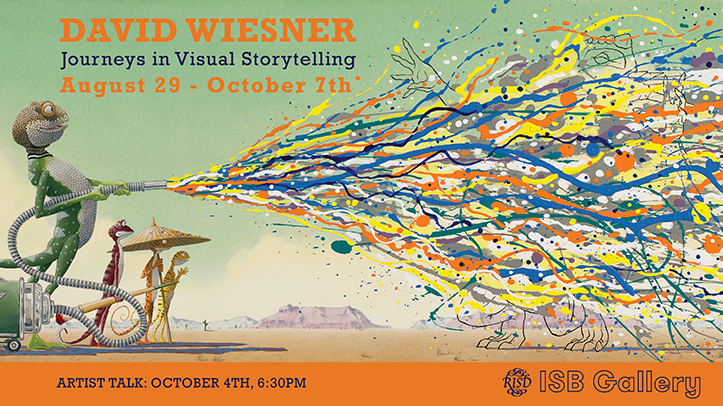 For details and registration please visit gloriagemma.org. The Memory and Aging Program (MAP) at Butler Hospital, a member of Care New England and a major teaching affiliate of the Alpert Medical School of Brown University, will host a GeneMatch swab and information booth on College Street Bridge. In partnership with the Global Alzheimer’s Platform Foundation, the purple-clad MAP Swab Squad will be offering free genetic testing and answering questions about Alzheimer’s disease (AD) and the research being done at Butler Hospital. To participate in GeneMatch individuals must be 55 to 75 years old, live in the United States, and not have a diagnosis of cognitive impairment, such as mild cognitive impairment (MCI), Alzheimer’s disease, or dementia. Participants should not have anything to eat and only drink water for one full hour prior to swabbing. 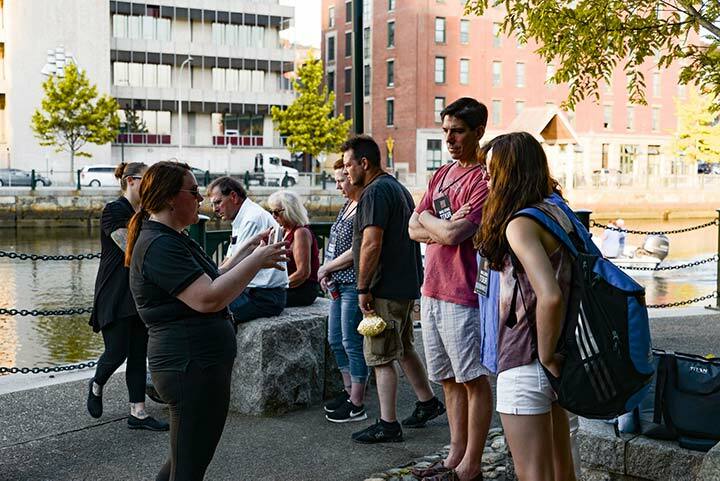 The swab kits collected at Waterfire will be mailed for processing by MAP team, and the person’s name will be added to a registry of potential research participants. 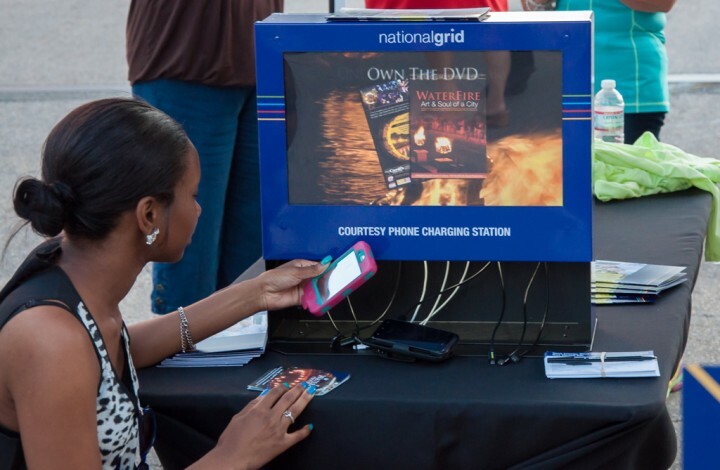 The Steeple Street Unplugged Stage returns with another night of live local music during WaterFire. Brian McKenzie is a versatile singer-songwriter, guitarist, producer, and musician whose music has been described as heartfelt truths, intertwined with emotional musicality and memorable melodies. 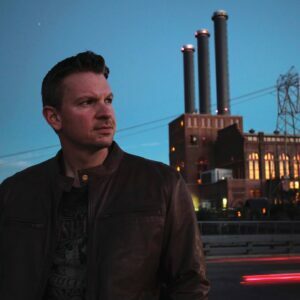 With 3 albums under his belt, Brian continues to spread his soulful, melodic songwriting, touring nationally and performing with acts such as Toad the Wet Sprocket, The Mavericks, Tyler Farr, Phil Madeira, and The Mallett Brothers, among others. 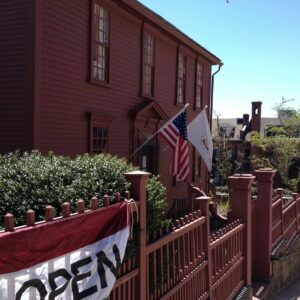 He will be playing two sets on Steeple Street between 8:30 – 9:15 pm and 9:30 – 10:15 pm. Fire dancers Spogga and Cirque De Light’s Liz Knights will be performing on the river throughout the night. This was beautifully done, but not at all like ‘the bare necessities’ info sheet sent to me a two days ago. I printed my own copy and comparing it to this site, there is little the same. Shouldn’t we working the fire have the information about things people might ask about to us? This used to be pro forma, but this year, no, and so I bring my own. But I won’t copy all this. Hello all. Hello, I hope you are well. I was at Watefire on Saturday September 29, 2018. There were various tables set up for artists who were selling their works. I was wondering if anyone knows of the artists that had stands that night? One of the artist’s had an item that I’d very much like to buy for my girlfriend for Christmas. I have a picture of the item itself, but I lost the person’s business card! So I have no idea how to contact them. Any help you could provide me would be greatly appreciated. Feel free to contact me at my e-mail address: jessecapece@gmail.com. These are some of the vendors, sorry I don’t have a complete listing – The Attic Project Jewelry, Jessie Jewels, Anne Made Designs, Debs Designs, Relic, Bonnie Lee’s Creations. I hope this helps.